Washington, D.C. (September 30, 2013) – Tuesday marks 20 years since the last significant investment boost to transportation infrastructure – a 4.3 cent per gallon gasoline tax effective October 1, 1993 under President Clinton. To symbolize the lack of action since and the current approach to the transportation infrastructure crisis, LIUNA is delivering rolls of duct tape to key members of Congress. 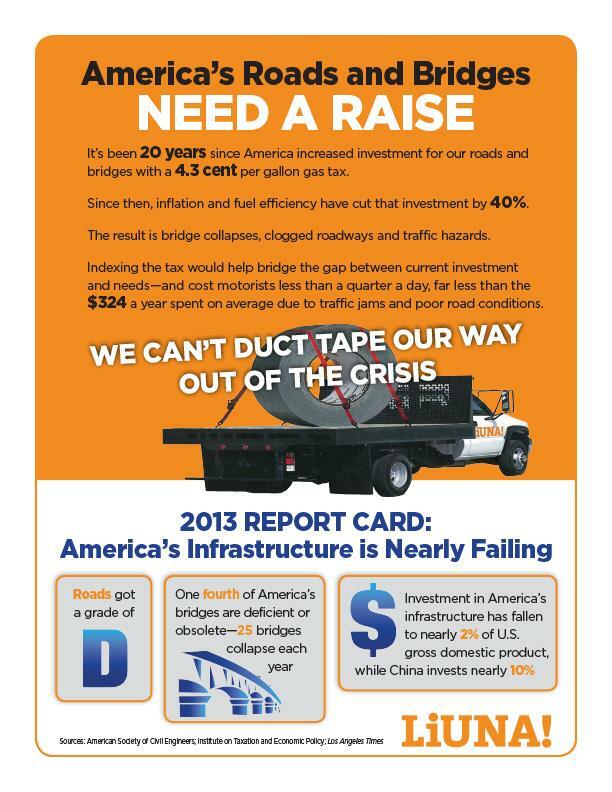 According to the American Society of Civil Engineers, the U.S. transportation system is nearly failing. A fourth of bridges are deficient or obsolete. Half of urban roadways are considered deficient, costing the average motorist $324 a year in wasted fuel and repairs. The average bridge in the U.S. is approximately 45 years old, dangerously close to the average lifespan of 50 years. On average, 25 bridges collapse each year, according to the federal government. The value of investment in transportation, when adjusted for increasing construction costs, has actually declined by nearly 40 percent since 1993, according to the American Association of State Highway and Transportation Officials. According to the Civil Engineers, the shortfall for bridges alone is about $8 billion a year, and overall roadway needs total $170 billion a year – more than triple the current federal investment. Congress has repeatedly avoided addressing shortfalls in the Highway Trust Fund, the key way the U.S. invests in its bridges, highways and transit. The trust is funded by revenues from the frozen gasoline tax, while construction costs increase and fuel efficiency trims incoming revenue. Being kept alive by Treasury transfers and multiple short-term bills or extensions, the fund is expected to again face insolvency in less than two years, according to the Institute on Taxation and Economic Policy. Had the 4.3 cent gas tax been indexed in the 1990s, it would have raised $215 billion in investment resources – including $19 billion this year. “That alone would not solve our crisis, but it may very well have prevented bridge collapses and saved lives,” O’Sullivan said. In recent testimony before Congress, O’Sullivan said that while all investment options must be considered, none are viable without a strong federal role. Cities, counties and private investors cannot meet the needs. With the current authorization for the Highway Trust Fund set to expire in a year, O’Sullivan said now is the time to begin a thoughtful discussion. “With some sectors of the economy improving and other sectors, such as construction and manufacturing still struggling and needing a boost that transportation investment can provide, indexing or increasing the gas tax should not be rejected out of hand,” he said. LIUNA has been on the forefront of the effort to highlight America’s infrastructure needs and to build a commitment to address them. The union has erected billboards warning of approaching deficient bridges, aired radio ads likening our bridge crossings to Russian Roulette and driven its “Emergency Bridge Repair Team” truck – complete with a giant roll of duct tape – to the offices of members of Congress. The union recently released “Risky Crossings,” a national interactive map of deficient bridges. All can be found at www.liuna.org/bridges. In addition, LIUNA released a mobile version of the map, which warns motorists as they approach a deficient bridge and allows them to contact Congress.